i figured. which is why i said it. i would never hurt anyon on here on purpose. so yeah, Nuts and Pretzels aren't bad, or bad for you, but they are nut nutrient rich and suitable to be staples in a diet. The are nice supplements to a healthy diet, and nuts have some benefits. Those benefits are short circuited if you have any health issues other than Cholesterol, particularly High Blood Pressure, like my Dad. All the Omega-3s in the world are worthless if you're blood pressure is 250/170 or worse. I AM NOT WRONG but I am honestly cracking up as I make this valid yet ridiculous argument with someone who agrees with me, but took me down to do so. again, the nerve, THE NERVE! You were demonizing them, just admit it! And if we're going to that route re: heinous cereals marketed towards children, at least go with Cocoa Krispies or...and I hate to admit this, but...Cocoa Puffs!! No I wasn't... I was finding a way to keep myself from going through a bag of Dry Roasted lightly salted almonds every 3 days like I used to when I thought they were going to be a help and not a hindrance to my High Cholesterol. Sooooooooooooooooooooooooo Gooooooooooooooooooooooooooooddddddd. Always made me crave chocolate, so I would mix in Dark Chocolate covered (or chocolate yogurt) Raisins... For their Fiber and Anti-Oxidants. Salty dense Crunchiness then Tangy chewy creamy contrast. It was BLISS. I eat pretzels a lot, usually the good, but sometime the bad... Snyder's Honey Mustard and Onion Sourdough Nibblers being a new fascination, but Old Tyme being KING. But A serving is 3, which has 8% of your daily Carbs, and a bag has 15 servings. Very VERY easy to over indulge. Needless to say, I'm very health conscious since my Dr. made it very clear to me at the ripe old age of 28 that Bad Cholesterol can come from Diet or Genetics, but that if anything, too much nutrition, regardless of the original content of the food, becomes fat, which increases cholesterol. So it's Always about portion control. Always. I will demonize to no end, cause of all the things in my life, diet is the one that has been presented to me as an immediate threat to my life, even though it also sustains it. So yeah, sometimes you gotta talk yourself down from the Delicious Ledge of the Gingerbread 10 Story Building. Andy Capp's Hot Fries. They're quite hot but I like them cause the hotness doesn't overwhelm the underlying delicious flavor. If all cement mix tasted like Pebbles, there would be no sidewalks. @Wil I love the Honey Mustard and Onion ones are amazing but I never eat them. @Cynthia I love cereal. SO. MUCH. Strawberry Delight Mini-Wheats are one of my favorites. I seriously love pretty much any cereal. Apple Cinnamon Cheerios are also towards the top of the list. in particular. 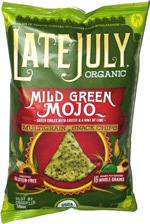 Perhaps the perfect spicy, tangy, cheesy, snack chip.